and gnashing of teeth in the Landy household. With great thanks to my Irish friend Elana, I’ve salvaged my pride a bit by using some of the tea/apple syrup as the base for a fizzy drink! So now I’ve created a non-alcoholic fizzy cider that looks, feels and kind of tastes like hard cider, but is safe for kids. It’s crisp, light and Hannah likes it. WIN! Another win to make today exciting is a new book I received in the mail, 10 Secrets of the Laidback Knitters. This book is filled with that sort of common wisdom. There are interviews, profiles, patterns and inspirations. I’m more of a scanner than a reader, and react to images as much as to words, so I was very happy to see the wealth of lovely images and photographs included throughout the book. I also heartily enjoyed the profiles on different knitters. 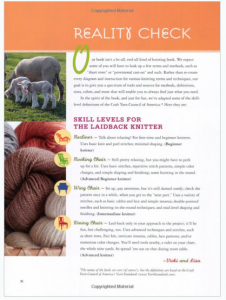 I know that many knitters enjoy a good read, and I think this will resonate with a large percentage of our knitting population – it’s always good to be reminded that knitting is a recreational, voluntary activity and we engage it in for our pleasure. is always a good goal. 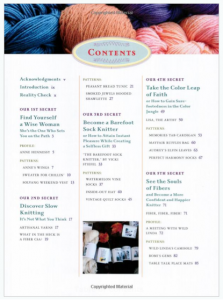 The one omission I see is a short “how to” section on creating a knit and purl stitch. Even just a few clear images of a knit and purl stitch in process would have been a nice addition. I would also campaign for an accompanying section on the fact that there are myriad methods of creating knit stitches. This is still, sadly, something that’s not universally accepted, but I feel it’s key to being a relaxed and ‘laid back’ knitter. 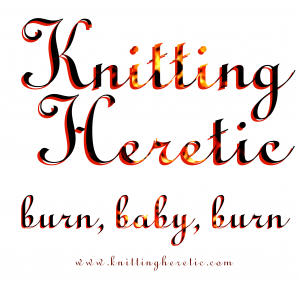 I was surprised and gratified that Lisa lists my first book, Confessions of a Knitting Heretic in her must-have list (it’s by ModeKnit press, btw) – that was a nice surprise! 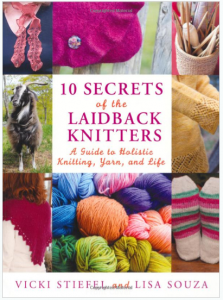 This entry was posted in Book Review, Philosophical and tagged laidback by Annie. Bookmark the permalink. See! You were’nt making jelly, you were making yummy apple/tea drink concentrate! Mess up jelly once, it’s a mistake. Mess it up twice, and it’s a NEW FOOD sensation!! 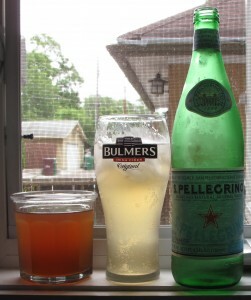 omg, i just made an apple spritzer with the jelly juice and it is DELISH. thanks for the tip. i may need more of this stuff.